This page is dedicated to the most Frequently Asked Questions about Mudi and Komondor that I have received. I hope this page helps you to decide if the breed is the correct fit for you! What is it like living with a Mudi? 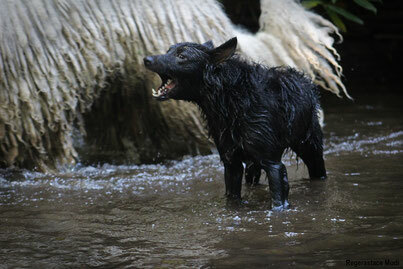 I cannot think of a breed that you could relate to a Mudi. 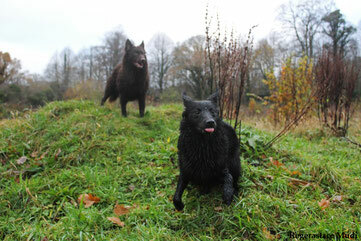 Living with one is never boring, they always have something to do or show you and will keep you busy. I would always recommend to people that if possibly meet one before confirming your decision to bring one into your life, although even I had not met one before purchasing my first and it is a decision I have never once regretted, I will now always have Mudi. They enjoy learning new tricks and always watch their people to see what they are doing next. Affectionate, some mudi can be clingy and always attaching themselves to their owners, while others will be happy as long as the owner is in sight. I've had mudi who loved nothing more than coming to events where they would gain a lot of attention (such as family gatherings, pet expos) and I've had Mudi who would prefer our time was spent with just us or with less attention directed to them. This does not make them nervous, but rather aloof. Even some of the most confident mudi would rather not have to deal with attention from multiple strangers petting them at once. Are Mudi similar to Border Collies? No, I would not relate Mudi to Border Collies. I owned border collies before Mudi and the two, while having a few similarities, cannot quite be called similar. Mudi can be more quirky than the average border collie, they are more watchful and aware of their surroundings and always on the look out for the next goal. Mudi are more independent and even during sports can have their own ideas or be thinking of ways to do things quicker; which isn't always a good thing, as could result in contacts being missed or poles knocked. While many border collies will naturally have a high drive for toys and tug, it is common that the enthusiasm in Mudi when they are young needs to be encouraged for them to develop into 'high drive' adults. Mudi are the louder of the two, and from my experience Mudi take fewer repetitions of training tricks to catch on to what you are asking than Border Collies, yet borders would be the more tolerable of the repetition when/if required for more difficult tricks. Both breeds have very different herding styles also, while border collies use their powerful eyes, a mudi uses its bark and wits to move the sheep or cattle. What are Mudi temperament like? The temperament of a Mudi is something which often comes up in discussion even with other breeders, what is and isn't acceptable. Mudi tend to be weary or aloof of strangers and if not given the essential early socialisation, will not want anything to do with them and may bark or growl when a strange human or dog approaches. They are one person dogs who bond strongly with their human and always want them in their sight, in my experiences the breed does not however suffer from SA (Separation Anxiety) and are content to lie, watch and wait for their people to come back. There are different temperaments throughout the breed in different bloodlines, so it is important you do your research on the parents, and even grandparents of any litter you are considering to ensure you are on the right path to the perfect Mudi for you. 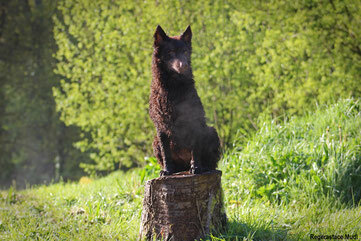 Many Mudi can be nervous, jumpy or become easily spooked, and a lot of the times it is not so much that the dog was not socialised early enough but rather that it is a genetic component passed to the dog from its parents to be fearful. As puppies socialising should be a big part of the Mudi's first few months, with people, other animals, dogs, and outings. Anything you are hoping to do with the dog as an adult it should experience in a fun and positive way as a puppy so it associates the scenery with good memories and fun! How much exercise do Mudi require? Mudi are an energetic breed that love to stretch their legs and lungs for a good fast sprint whenever given the opportunity. A breed that I've found easy to train to be offlead, they never stray too far from their people and will always check in to make sure you are still in their sight. They would not be content with only living strictly inside the house, regular outings, preferably ones that would allow them to be offlead, are essential for the quality of life. However if you are having an off day where you cannot walk your Mudi for any reason they are usually content to laze around with their owners and have a relax day without becoming destructive or overly energetic within the house. In my experience with Mudi their favourite walks are those that include other familiar dogs whom they know, mine get very excited if they see me lifting the Komondor leads as they know they will have more competition to chase and dreadlocks to catch! Are Mudi as noisy as I've been told? Yes, mudi love their voicebox and want to make sure everyone knows they do. Despite this, they can still be taught to be 'quiet' on command and to not bark when in the house. Both of mine love nothing more when we are out to run together and bark, yet in the house there is not a peep from them unless someone is at the door or the post arrives. During Agility or other active sport training it isn't uncommon to hear the Mudi bark when they get excited, it would be very difficult and likely dampen the dogs enthusiasm if it had to learn to control itself in these exciting situations. One of mines favourite times to bark is whenever she gets into water. She could go a walk being silent but as soon as its time to fetch the ball in water or even just jump in, her barking will begin the second her first foot touches in. Each mudi is different but their bark can be high pitched, and the kind the neighbours will not enjoy listening to if you are leaving the mudi alone in the house. Are Komondor good with other dogs? As much as this is repeated, this is another topic that can be linked to the socialising completed. 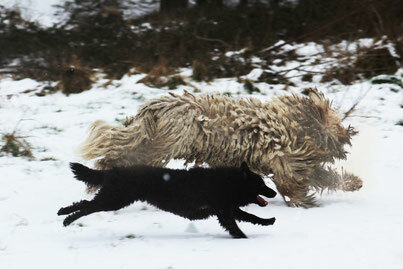 Naturally, Komondor are going to be less tolerant of other dogs than lets say a Labrador or even a Collie type. They will not tolerate a dog in their face, taking their food or even in many cases coming too close to 'their' people. They remain a livestock guardian dog and in order to live in harmony with this breed, that needs to be remembered. However, socialising can help to desensitize them to where they will be less watching of dogs on walks and even more tolerant of dogs who approach them outside of the property. Many Komondor are able to enjoy being walked without feeling like they need to guard everything, when it comes to their house or land you shouldn't expect the dog to enjoy the company of a strange dog in these areas. My komondor were socialised well, and even my male is very tolerant of even irritating dogs who try to charge towards us, he will warn them and tell them off fairly. There are certain appearances in dogs that can cause him to react different, for example Husky/Malamutes and Czechoslovakian wolfdog are a few who he shows an outwards dislike to. He also dislikes golden labrador and weimaraner after meeting one of each who attacked him and now he looks out for any dog alike. Komondor are the kind of dog who most certainly hold a grudge, and rarely ever forgive or forget. Do Komondor make good house dogs? .Each persons idea of a house dog is different, so this question can have various answers. Will your dog have access to a high fenced in garden? Will they have somewhere comfortable to lie themselves? Is the house quiet or busy? Komondor would not make good apartment dogs, they require the room to stretch and move their legs and would knock a lot down when they become hyper indoors if everything was cramped together. If you have a house without many visitors, that has a garden the dog will have access to as well as a quiet place to lie down then yes, a Komondor could make a good dog provided it is given enough walks to keep it satisfied. However if you have a busy household with people coming in and out, noisy neighbours and a lot of activity around you the dog could develop the habit of barking - which would cause neighbour complaints - or even for some, become stressed that it cannot feel in control of any situation. The perfect house for a Komondor is someone, or a family who live on a little bit of land or will be dedicated to seeking out the ground for the Komondor to exercise in, they can provide a room/crate/safe place where the dog can go to when guests are around if the dog is uncomfortable and who understand that the dog the are living with they do not Own, but rather are Partners with. Are males or females better for Guarding Livestock? Its hard to recommend one above the other, more so than gender different breeders lines of Komondor react differently. Komondor are known in Hungary for their guarding style which allows someone to enter the field, but do not let them leave again. Stealth and agility are their main assets, blending with the sheep until it is too late for the predator who is now the prey to leave. In my experiences the females are louder and more likely to charge the fence to prevent someone from entering in the first place, they will make a show of themselves and intimidate predators before they have even crossed the barrier. Males may seem relaxed in watching, but as soon as they feel threatened or feel like something has crossed the border into their territory they react with a ferocious attack which leaves little hope. Komondor are not a breed known to stray off of their property, they take their guarding posts very seriously. At night they often follow the same path even in darkness as a routine to ward of enemies, marking around the border of their land. How difficult is the corded coat? 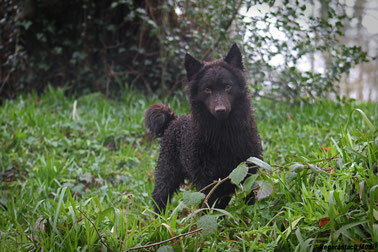 Once the puppy coat phase is over with (anywhere from 16/18 months - 2 years) the coat is relatively easy to maintain. Picking out anything such as twigs, seeds or leaves that have gathered and occasionally re-splitting the cords will not take anymore of your time than what it would take to brush the average dog, the only difference being with a Komondor it must be done by hand. Please visit my 'Komondor Coat' tab at the top of the page for a more in depth view of the Komondor's coat! Do Komondor handle the heat well? The Komondors coat work as a ventilator for both the heat and the cold. When it is cold, the thick, dense coat allows for them to remain warm. When the weather changes to heat, the cords prevent the sun from reaching and heating the skin and therefore increasing the dogs body temperature. 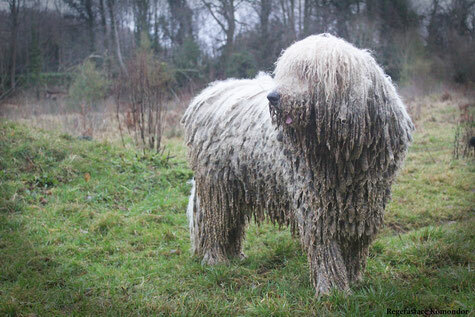 A Komondor should never be shaved to the skin, particularly not to prevent them from 'overheating' as this will only make it worst. Many Komondor when shaved develop heat stroke, and even more end up with hot spots which their owners claim were never an issue until shaved in the particular area. My komondor have handled all weathers well, in the sun when it is warm they can become more lazy and seek out shaded areas which should always be provided, but in terms of being uncomfortable with the weight of their coat or heat becoming trapped in the cords, I have never had any issues.